St. Edward race is this Thursday! The forest has suffered some wind damage, but the trails have been almost fully cleared. There are some trees still down, but you can certainly go either over or under them. The race is on! The course is somewhat simple in terms of junctions and turns, but has one large climb for short course; two large climbs for long course. It is likely some hiking will happen there. The start is in a different location than the finish. See the map. Finally, there is one location where course will go around some wind debris, please do not shortcut - it is for your safety. Short course is 3300m, long course is 5924, not accounting detour around the debris. The orange flags will denote the long course. Red flags - the short course only where it does not match the long course. For a very short distance. Checkpoints will have a preceding exclamation mark (!) sign some 20-30 feet before them. Some CPs were missed last time. Start and finish will not have a sign on them, but instead by them. We are also improving the registration - instead of one clipboard, there will be three. It is unclear whether we will have a demonstration course. It is likely we will have a very small one. For fastest experience we suggest printing and signing the waiver before you arrive. We will likely have punch box per stand - this way they will be awake after the first runner. Map is exported at 300dpi for 1:10000 scale. This is the working copy with all markings. The registration is available here. We went to St. Edward State Park to look at wind damage after Saturday's storm. Northern part of the course is very OK.
We have finished the trail markings for the Thursday race - quite a few new, mostly to improve the communication about an upcoming checkpoint. We also went to Redmond Watershed. We finished measuring the courses. It is likely we will have to shorten them. As drawn the short course is around 5k which is too much for our standard. No real wind damage observed there. Jourdan Harvey recorded his winning run on Long course. And then shared it with us: I hope you enjoy it as much as I do! Results are here! Let us know if there is some mixup with names or times. In short course Breseman family dominated. In long course Jourdan was fastest by quite a lot, taking all legs first. Mark Plesko was near, but missed a checkpoint. We took the freedom of moving Paul and Janis to short course - because they got to all controls although taking some long side steps. Some photos will be shared through here likely tomorrow. Weather was really nice; a bit warm. Technically - course was ready around 2pm or so; some small software glitches, but everything else went as planned. Volunteers: Gunta helped with course setup; Atis helped with photos and taking tent etc. down; Murray picked up the controls and basically enabled the results be published before 10 pm. Paula helped with reconstructing the course after some disturbances - there were some issues with random people picking up some markings. If you see a marking in the bushes, let us know - we will pick them up. We will add some additional flagging around checkpoints to make them more visible. Likely green flags. St Edward State Park! Sep. 3, Thursday. We very much appreciate you all being at the first Forest Run. We hope you liked to Run a Forest Run! We are looking for any feedback; leave a message here in comments; send email; post on facebook. On-site registration will be available, but we might have issues with change. Please plan accordingly. 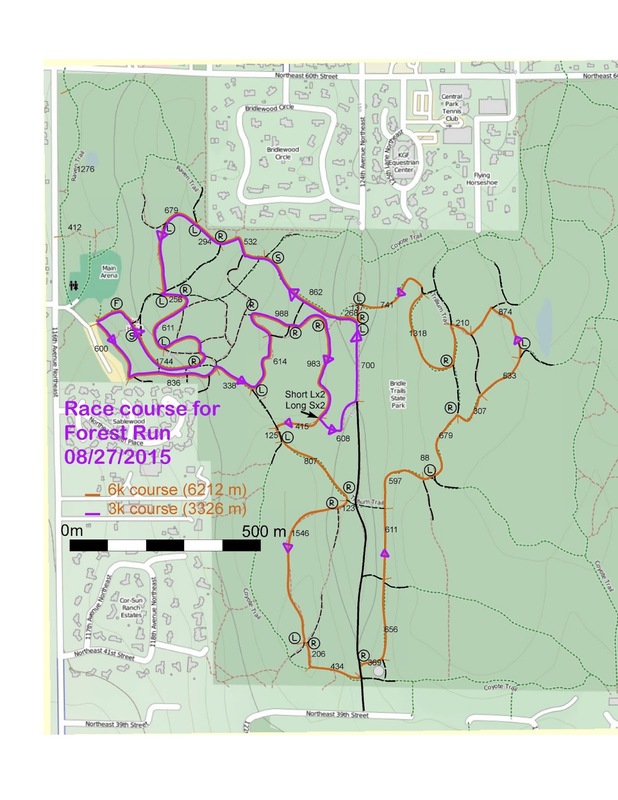 Bridle trails race is soon! Weather has been negotiated good: 10-20% rain, pretty warm. Finally, we have been fairly active with St. Edward and Redmond watershed races as well - St. Edward has been fully measured while Watershed is at least partially done. Bridle trails course has been finalized and measured. See updated map here. Course lengths are 6212 meters and 3326 meters. Course markings have been designed and will be finished this weekend. Race page here, and registration here! This is the last race of our pilot season. It also has shorter start window.